Hated by many die hard Nissan fans, common in the Asian Community. 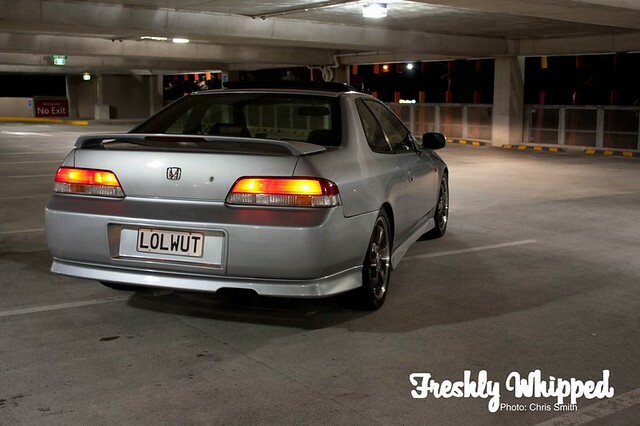 Love ‘em or hate ‘em, Hondas play a big part in the NZ Car Scene. Sadly thought, many of them stand out from the crowd for the wrong reasons, however Ben Edwards has done a great job in making sure that his Prelude is not part of this group. Silver paint with black rims looks great on cars, with this Prelude being no exception. Clean and simple often looks better than going all out. This daily driven Prelude sits on 17” BSA Rims, wrapped in Hankook H424s. I was amazed when I was told that the kit on the car is stock. Could have fooled me into thinking it was aftermarket. Good job Honda. By now you may have noticed the one of kind License Plate. Anyone who doesn’t understand should Google ‘lolwut’. Interior still in great knick, out with old seats and in with new Type R Recaros. Like any type of car meet, big or small, the hood was up for the blokes to stand around and chat about. In this case a H22A. A white Ultra Racing strut bar and Password:JDM covers are a few of the mods that can be found here. A free plug for the boys over at NZHondas. The pick of the shots from the evening. Great piece of eye candy. Cheers Chris. These three are as far as the budget could stretch to in terms of hiring Models. Our apologies.